What Day Of The Week Is August 14? 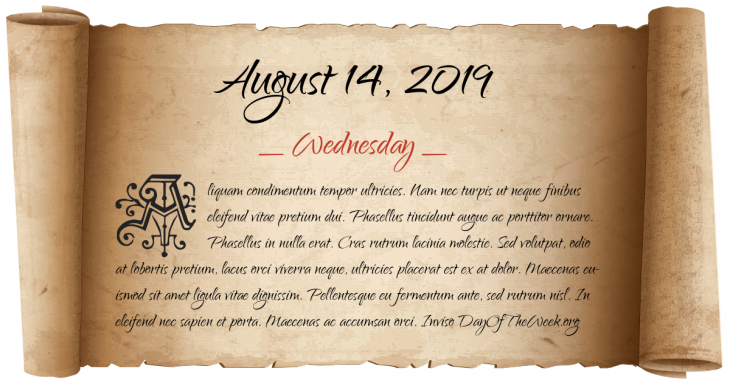 August 14, 2019 is the 226th day of the year 2019 in the Gregorian calendar. There are 139 days remaining until the end of the year. The day of the week is Wednesday. Taira no Munemori and the Taira clan take the young Emperor Antoku and the three sacred treasures and flee to western Japan to escape pursuit by the Minamoto clan. (Traditional Japanese date: Twenty-fifth Day of the Seventh Month of the Second Year of Juei). Franco-Hova War: The town of Anosimena is captured by French troops from Menabe defenders in Madagascar. United States Social Security Act passes, creating a government pension system for the retired. World War II – Winston Churchill and Franklin D. Roosevelt sign the Atlantic Charter of war stating postwar aims. The Pakistani Constitution of 1973 comes into effect. The second Turkish invasion of Cyprus begins; 140,000 to 200,000 Greek Cypriots become refugees. Elsewhere, 126 Turkish Cypriots are massacred. Lech Wałęsa leads strikes at the Gdańsk, Poland shipyards. Ilich Ramírez Sánchez, also known as “Carlos the Jackal,” is captured. The 2007 Kahtaniya bombings kills at least 796 people. Who were born on August 14?